There is not much new in management, but there is a lot new in business. 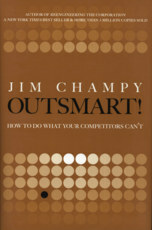 Jim Champy revolutionized business with Reengineering the Corporation. Now, in Outsmart! he's doing it again. This concise, fast-paced book shows how you can achieve breakthrough growth by consistently outsmarting your competition. Champy reveals the surprising, counterintuitive lessons learned by companies that have achieved super-high growth for at least three straight years. Drawing on the strategies of some of today's best "high velocity" companies, he identifies eight powerful ways to compete in even the roughest marketplace. You'll discover how to find distinctive market products, services, delivery methods, and unexpected customers with unexpected needs.